Features a magnet and folding stand for convenient storage and use. Veal (roast and steak) 63°c. Veal (minced) 71°c. Features a magnet and folding stand for convenient storage and use. The Stainless Steel cord is flexible enough to go round the seal of an oven door for the perfect monitoring of roasts. The Dual-Sensing Probe Thermometer/Timer (DSP1) is the first in the CDN line to measure both the temperature of the oven and the temperature of the food being cooked. 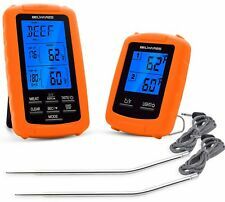 Ideal for monitoring roasts and other meats in the oven or on the barbecue. Constructed of stainless steel the probe measures approximately 6 ¾ inches, with a 39-inch sensor cable. The Dual-Sensing Probe Thermometer stands approximately 7 ½ inches (19 centimeters) tall and 3 inches (7.6 centimeters) wide. For added convenience the thermometer features two-way mounting via magnet or stand. The timer counts both up and down by hours, minutes, and seconds, up to 10 hours. 1.5V AAA IEC LR03 Alkaline battery and instructions included. Model: DSP1. Probe Length: 4.4" stainless steel probe. 🇺🇸 Foldable Probe is safe and clean for portability and storage. Certifications: CE certified, RoHS, FDA approved probe. Kitchen Tool series ：. 🇺🇸 Daily water resistance and it is easy to read with big backlight ultra-clear LCD screen. Get an accurate temperature reading on cooked foods with Taylor's Digital Thermometer. The water proof thermometer displays an easy to read 4 digit LCD readout on a 1 inch dial. The 5 inch stainless steel stem stores in an antibacterial storage and carrying sleeve. 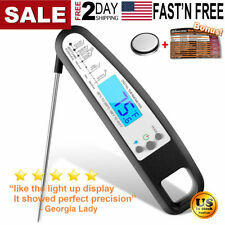 The temperature range is from 40 to 450 degrees F, and 40 to 230 degrees C. The NSF listed thermometer uses a watch battery for power and an on/off button protects the life of the battery. The thermometer measures 5 3/4 inches long and comes backed by a 1 year warranty. Instant Read Bi-Therm. -On/Off Switch. You'll receive an alert once it's ready to take off the grates. 1 kisslink Smart Grill Pro. Simply plug the probes into the desired foods. Keep the LED indicator away from heat. 2 Probes. Digital Kitchen Cooking for BBQ Smoke Grill Oven Baking. IKEA 801.521.55. THE CORD IS HEAT-RESISTANT UP TO 480°F/250°C. MAGNET ON BACK - STICKS TO A REFRIGERATOR ETC. Manufacturer Part Number 9867B. Ultra fast response. Bright backlight. F/C switchable. Inhibits the growth of bacteria. Turbo folding. Temperature range: 40° to 572°F or 40° to 300°C. Includes: Includes 2 AAA batteries. KitchenAid Wireless Remote Timer and Thermometer - KN128BXOBA - BRAND NEW!. Condition is New. Shipped with USPS First Class Package. Good Housekeeping GOOD BUY AWARD. Bonus pan clip. Featuring a 150 foot bluetooth smart range, get back to what's most important to you with the comfort of knowing your food is being cooked to perfection. using the free idevices connected app, select what you're cooking from the list of preset temperature alarms, or create a custom alarm. The Android or iOS app needs to be installed and run on both devices. iOS devices do not need pairing. A convenient choice is using a table as main device (Chef) and a smartphone for remote monitoring (Sous-Chef). Don't worry. The air temperature reading that your oven displays is often inaccurate and can cause recipes to go awry. Keep it together. Adjustable Grate Clip. Position your Pro Ambient Temperature Probe between your oven grates. Color - Chipotle. The Javelin can survive 4,000 hours of continuous use on a single change of battery. We use food-grade 18/8 stainless tapered probes minimizes the puncture footprint on your food. Be able to monitor your food from up to 100 feet away! OR you can program your own desired alert temperatures for any food. Transmitter is designed to hold receiver when not in use. It is also sealed against rain intrusion and features red light when transmitting. Taylor Digital Oven Thermometer 32 deg. F To 392 deg F.
F Maximum Temperature: 392 deg F. deg. F Length: 5 in. Instant Read: Yes Battery Type: AAA Batteries Required: Yes. F To 392 deg F. Product images are for illustrative purposes only and may differ from the actual product. Easy Read VBQ-PGT-001. IPhone Android App. EASY READY DISPLAY. Easy cable caddy. Temp alert. Built-in battery. Magnet: Neodymium. Wipe clean with a damp cloth. Care instructions. The cord is heat-resistant up to 428°F/220°C. Good to know. Special waste handling may be required. People & Planet. Quantity: 1. Sheath can be used as handle extension. 2-way mounting: pocket clip/hook. 2.75"/7.0 cm stem with 2.5 mm reduced tip. Auto-off after 10 minutes. ABS Plastic, stainless steel stem. Model Q2-450X. Brag about your barbecue masterpiece or even take notes from iGrill users around the globe. The Weber iGrill app is your dashboard for all Weber iGrill connected products. Free Weber iGrill App has temperature alarms, custom alerts, exclusive recipes and social sharing. 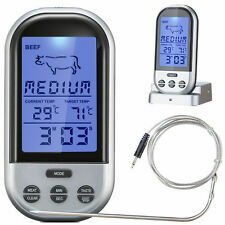 You are viewing one new never used Prograde WiFi Grilling Meat Thermometer VBQ-PGT-001 Works w/iPhone & Android. Thanks for looking and shopping, please shop again. DTP482 Hi Temp Probe Thermometer by CDN. Programmable & Meat Doneness Settings! What Should I Do If An Item Is Missing From My Order?. How long does it generally take to process an order?. How Long Does It Generally Take To Process An Order?. Brag about your barbecue masterpiece or even take notes from iGrill users around the globe. The Weber iGrill app is your dashboard for all Weber iGrill connected products. For use with free Weber iGrill App. (1) KenmoreCook! Convenient 12-hour clock feature on base. Remote notifies you with light, sound and vibration up to 200 ft away. Multiple remote alarms signal food is almost ready, or complete. Includes Base, probe, remote and four AAA batteries. Connecting to Bluetooth for easy access, you can monitor temperature on your smartphone or tablet to make sure you get your dish just right. Salter Housewares. Designed with sleek curved sides and a Bluetooth light, this nifty device is small and stylish. 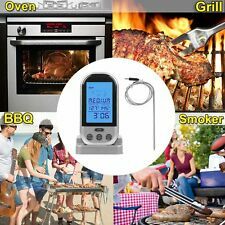 Q-Tech Bluetooth meat thermometer. Pairs with your smartphone via Bluetooth. Monitors the internal temperature of your food and alerts you when it's done. Download the free q-tech app and pair your phone with the thermometer. Includes 11 presets for dishes like beef, pork, poultry, plus customizable fields for your personal preferences. Stays connected to your phone within a range of up to 80 feet. Brand new in retail packaging. The App has a simple to use interface that allows you to choose from 11 (beef, veal, lamb, pork, chicken, turkey, fish, hamburger, BBQ Smoke, Hot Smoke, Cold Smoke) pre-set temperatures based on the protein that you are cooking. Opening the oven to check on a food's temperature means wasting the cook's time and losing oven temperature and moisture not to mention a face full of steam. This thermometer prevents those problems. 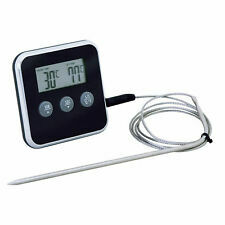 Insert the instrument's 6 inch stainless steel probe into a roast beef or turkey and monitor the time and temperature (from 32 to 392 degrees F) on the thermometer's large digital display, which connects to the probe with a 4 foot cord. The control panel sets cooking time and temperature, and an alarm sounds when either is reached. Fully opened, the thermometer/timer is 5 inches high, but it folds flat for compact storage. Magnets on the back permit it to be temporarily mounted on a metal surface. It also features a large Backlit LCD Display for High Visibility. Requires 4 - AAA Batteries (Not Included). Transmitter is effective up to 20m (65 ft.) away. Receiver Screen has Backlit LCD for high visibility. Model 1470. COOK FOODS toEXACT TEMP. without opening oven door. 32°F to 392°F range. These types of problems need to be presented to the manufacturers /suppliers / distributors. This is the responsibility of the manufacturers /suppliers /distributors. Keep your oven's temperature just where you need it! The air temperature displayed on your oven often is inaccurate. This ambient temperature probe features Bluetooth-Smart Ready Device providing you with alerts to precise temperature keeping your recipes from going awry.